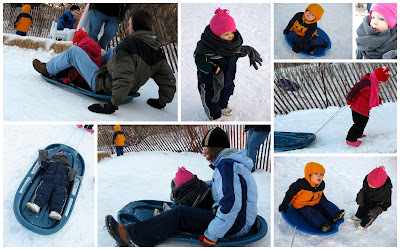 Despite having an ample amount of snow, we haven't been sledding much this winter. 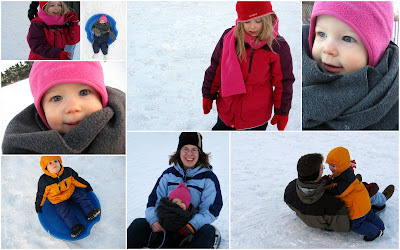 While we enjoy sledding, we much prefer to do it when the kids enjoy it. Meaning, it needs to be above 20 or 30 degrees. We finally got our chance this past weekend, with a whopping 35 degrees, and went twice. Sledding sure is fun. I have to say, our baby had that Randy thing going (from A Christmas story) the way she was bundled up. She couldn't walk up the hill by herself, nor could I carry her up without slipping, so she took several rides up flat on her back while I pulled the sled. Very entertaining to watch. But I'm glad it's warmer than 35 degrees here.